We’d visited Imperial Beach in San Diego, as far south as we were able to go. The dot in the middle of the sky is a helicopter, circling and circling the same patch of what looked like switchgrass in water. The signs said it a project to San Diego water works, but in reality, it looked a no-man’s land. The infamous border wall lies about two-thirds of the way up the distant range of hills. And the sky looks dusty. When we left San Diego a few days late, we drove Highway 1, next to the ocean, as often as we could. 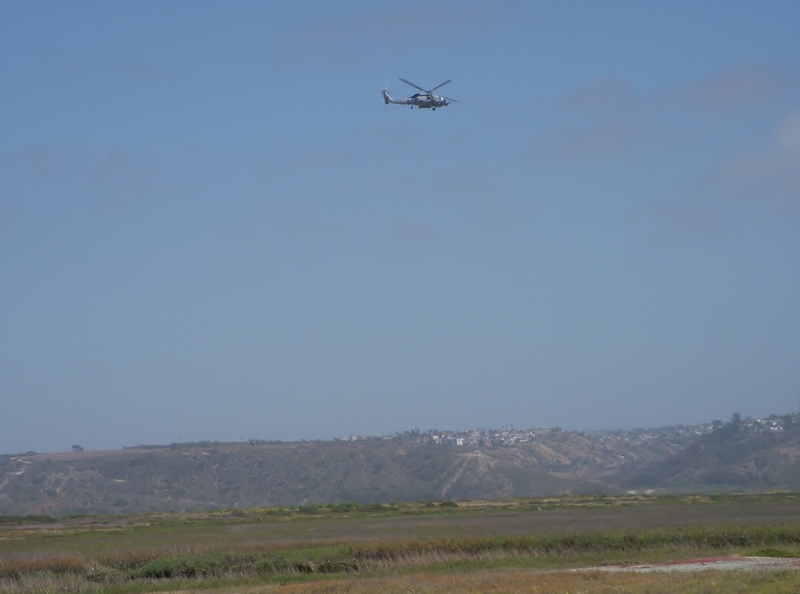 Camp Pendleton, a Marine base around for more years than I am old, sits just north of San Diego talking up a lot of real estate, along with several Navy sites. We had to get on the Interstate, go around the security zone, and then find our way back to Highway 1. 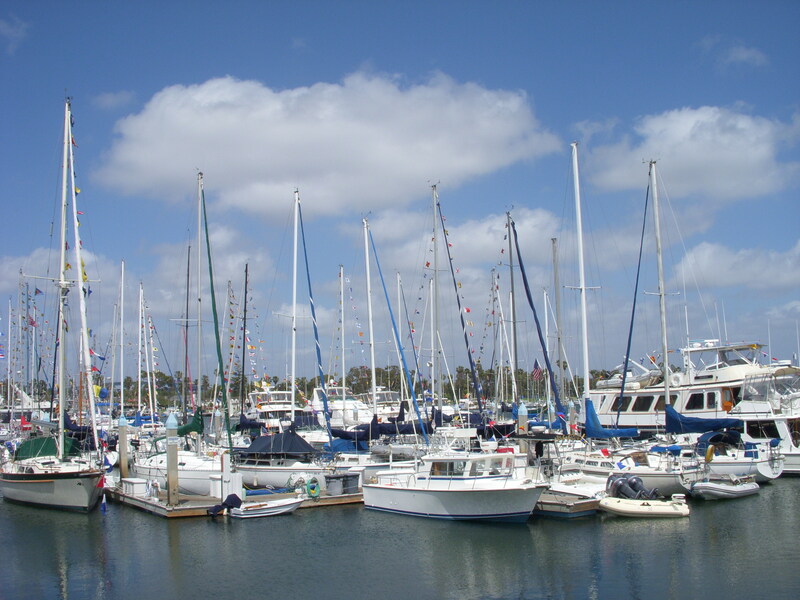 On one of our detours around – well whatever we were detouring, we came to the end of the road and found this most wonderful sailboat parking lot. How do they do that? Park those boats so close without damage? And then, beyond the zone of fancy security zones, we entered the zone of fanciful living communities. And state parks filled with people playing frisbee and running in the waves. And stately houses, some up on cliffs overlooking the sea and some along the beach, shoulder to shoulder – private beach, I might add. 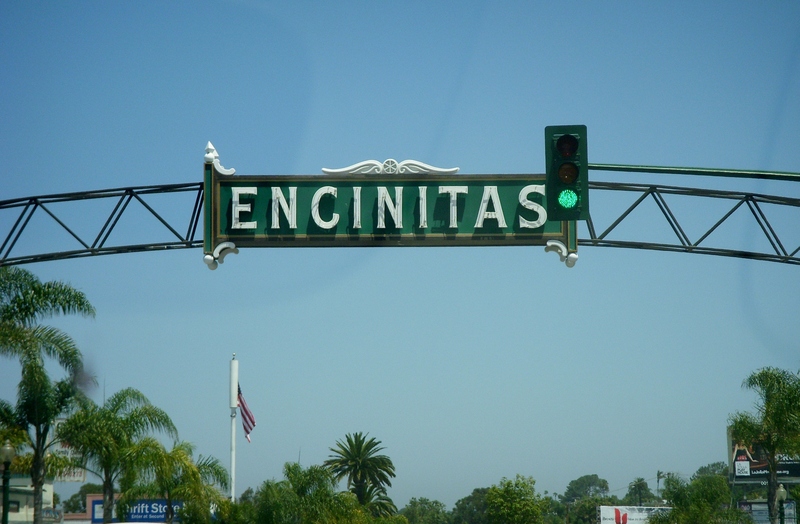 But then we came to Encinitas – and it was everything we might dream it could be. Happy and colorful and old-time hippie-ness. Sort of like Dude and Dudesses. It was very cool. And we laughed all the way though town. You’ll notice the sky is even a deeper and riper blue. But the oddest sky photo came a few miles on beyond the sea communities where the view opened into land and sea. Ahead, in the sky, a jet traced a perfect circle with its con trail. 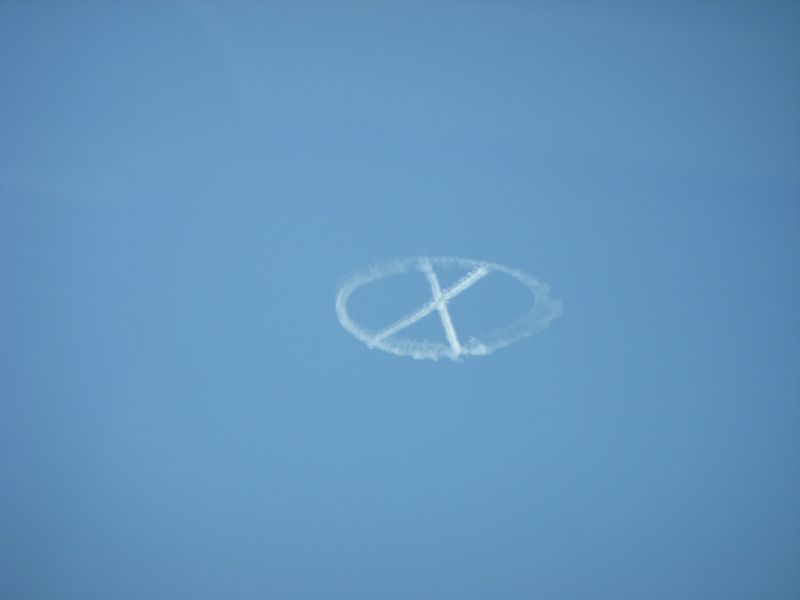 And if that wasn’t enough, the jet took off, made a turn, and came back to trace one line and then another into an X. Now that’s some flying acrobatics on a Sunday afternoon. The final two photos are from the drive back from California home. 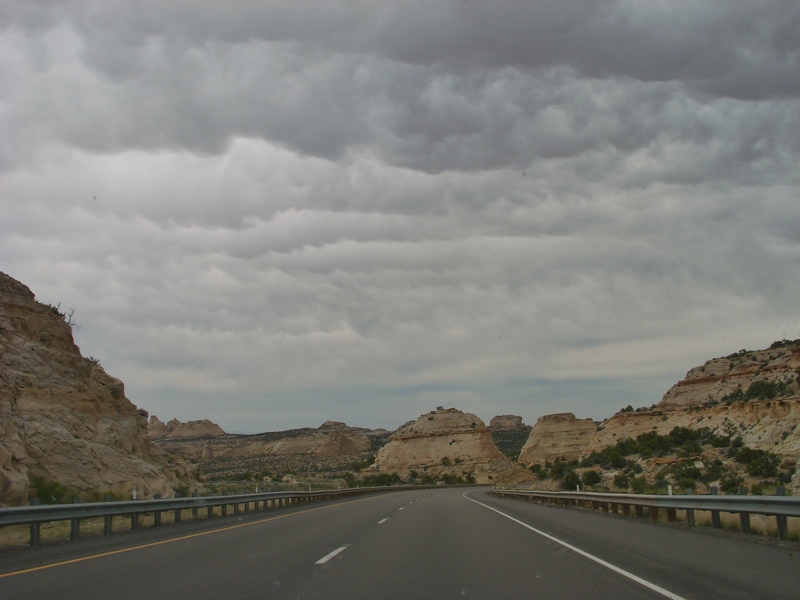 We went northeast from Los Angeles through Las Vegas and into Utah where we hit the tail end of I70 – which we then followed all the way home nearly to our driveway. Here’s the Utah sky between dun-colored hills. Dry hills that would have appreciated the clouds dropping inches of rain. But at least while we were driving this stretch, no rain fell. Actually, no rain fell on us all the way back for that matter. A clear-sailing road – can roads offer clear sailing? I’m mixing metaphors, no doubt. 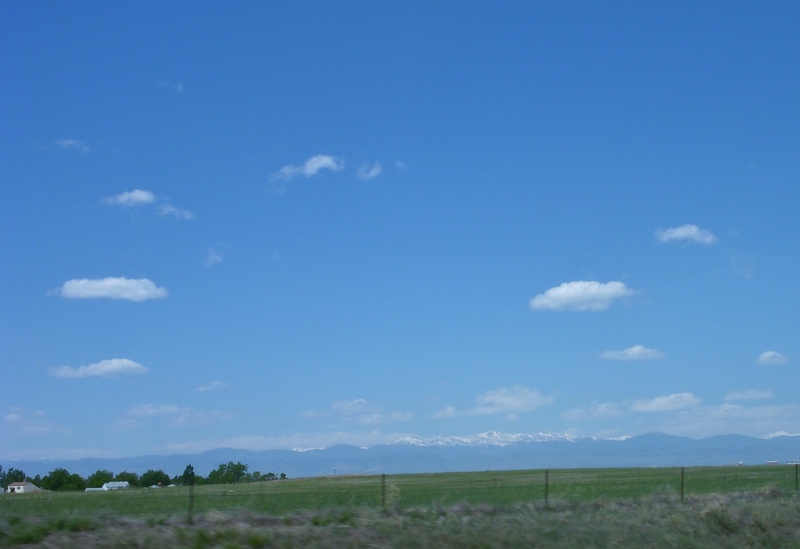 And then on through the Rockies which were more rock than sky, and at last, through Denver driving east, we looked back on our trail at mountains and snow (which we’d see quite a lot of) and sky. Beautify photos and not too bad on the narrative either. Thanks for sharing. You’re very welcome. Glad you liked them. It was quite an experience, driving so far and then back again. You’re welcome – and what a great observation and way of seeing it – the sky brushing up against the world.